2wcom Systems is one of the world’s leading manufacturers, supplier and system integrator of professional radio technology. Customers around the world benefit from first-class customer support, quality “Made in Germany”, exceptional expertise and experience. 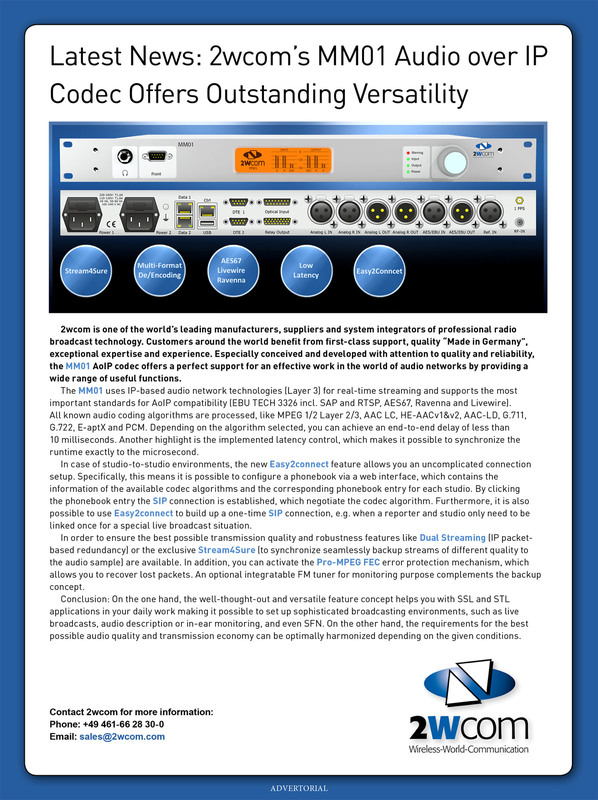 Especially conceived and developed with attention to quality and reliability, the MM01 AoIP codec offers a perfect support for an effective work in the world of audio networks by providing a wide range of useful features. The MM01 uses IP-based audio network technologies (Layer 3) for real-time streaming and supports the most important standards for AoIP compatibility (EBU TECH 3326 incl. SAP and RTSP, AES67, Ravenna, Livewire as well as Dante in future). All known audio coding algorithms are processed, like MPEG 1/2 Layer 2/3, AAC LC, HE-AACv1&v2, AAC-LD, G.711, G.722, E-aptX and PCM. Depending on the algorithm selected, you can achieve an end-to-end delay of less than 10 microseconds.